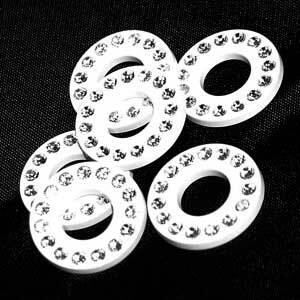 Swarovski round donut plastic component is part of their Plastic Trimmings range. Manufactured specifically for clothing, accessories, shoes, bags, and the jewelry making segments - it is extremely verstalie and wide ranging in its applications. This particular item has been used for earrings, lariat necklaces, and in latestst fashion trends of the haute couture fashion houses of Paris, Milan, New York, London, Dubai, etc.